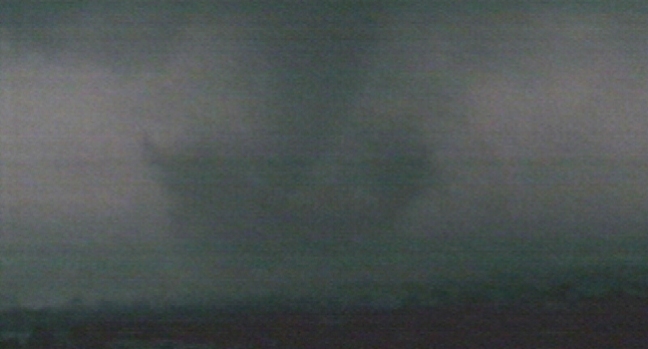 A tornado touches down in the distance. LONE GROVE, Okla. — Emergency crews searched damaged homes and businesses Wednesday after an unusual cluster of February twisters touched down across Oklahoma, ripping off roofs, littering roads with downed power lines and killing eight people in a town in the southern part of the state. Firefighters rummaged through debris, moving bricks and fallen walls, trying to make sure there were no additional victims in the hardest-hit community of Lone Grove, where the deaths occurred and 14 people were seriously injured on Tuesday, Oklahoma Department of Emergency Management spokeswoman Michelann Ooten said. They marked each damaged structure with a large, spray-painted X after searching it, and residents were then allowed to check the damage. Shirley Mose was not at home when the tornado struck, but returned Wednesday morning with members of her family to find the house destroyed and her pickup truck wrecked. Parts of Oklahoma are reeling after a line of severe storms moved through spinning off at least two tornadoes that killed at least three people. "I had a little Chihuahua that stayed in there," Mose said. "We found her bed, but not her. I guess she's gone." Residents apparently had good warning of the approaching twister. The National Weather Service issued a tornado warning, meaning a tornado is imminent and residents should take shelter, at 6:50 p.m. for Carter County. Another was issued at 7:15 p.m. when the actual tornado was spotted and the tornado hit Lone Grove at 7:25 p.m. Most of the deaths were in an area of mobile homes that was virtually wiped out, said Paul Sund, a spokesman for Gov. Brad Henry. All that was visible of the mobile homes Wednesday were the cinder blocks they sat on. Trees were uprooted or snapped in half, cars were flung around like children's toys, hoods of vehicles were ripped off. Debris was everywhere. Ooten said the National Guard was coming to Lone Grove to assist local authorities. There were unconfirmed reports the death toll go higher, but Robert Deaton, interim chief investigator for state Medical Examiner's office, said Tuesday morning that there were eight confirmed dead, seven from Lone Grove, and a truck driver from Jones, Okla., who was driving through the area at the time of the tornado. Ed Reed, the county emergency manager, also said the official death toll stood at eight. "We will do everything we can to get Oklahomans the assistance they need," Gov. Brad Henry said. "Our thoughts and prayers are with the people of Lone Grove and all of the other Oklahoma communities that have been impacted by the latest wave of severe weather. We know we have lost many lives in Lone Grove and we pray the losses do not rise any higher." The governor spoke to Department of Homeland Security Secretary Janet Napolitano and she said her department would offer any immediate assistance that was necessary, the governor's spokesman, Paul Sund, said. Lone Grove residents woke up Wednesday to scenes of destruction. Along U.S. 70, the main road into town, a furniture store had been destroyed along with some other nearby homes and businesses. Debris was lodged in high power lines. Trees were splintered, roofs were missing, many power lines were on the ground and power was out. Several utility poles were snapped, their transformers hanging upside down. Debris littered the ground. Trina Quinton stood next to a pile of rubble that used to be John's Furniture, her cousin's business, and wondered whether her family will ever recover from the storm. "This is where I was raised," Quinton said as tears rolled down her cheek. "this is where I grew up." "I'm grateful that the business wasn't open and they weren't here. "This is how they make their living, rebuilding is probably not going to be an option." Joe Hornback, 42, said the roof was blown off a post office a few blocks from his home. "We were very fortunate," he said. "We went into the only cellar on our block. There were 30 of us in a 6 by 6 underground cellar." He said there was a calm before the tornado hit. "Then you just heard the wind blow, just like you turned the light switch on." Lana Hartman rode out the storm with seven other people in a small clothes closet of the rental house she moved into on Monday. "We were all in the closet, the suction was so unreal," Hartman said. The tornado blew part of the roof off the house and lifted one of her daughters into the air. Everyone grabbed the girl. "I was in shock, I think I still am," Hartman said. "We're alive, that's all that matters." Rescuers found one woman injured but alive under an overturned mobile home. A team of meteorologists will be sent out to both areas on Wednesday to survey the damage, said Doug Speheger, a meteorologist with the National Weather Service in Norman. "We don't really have any indication of how a strong a tornado the Lone Grove one was," Speheger said. More severe weather was possible on Wednesday as tornado watches were issued for Mississippi, north-central Louisiana, southeast Arkansas and parts of Missouri and Tennessee. "It's just surreal," shop manager Michael Jerry said. "You just don't believe it. Especially knowing you were just there minutes before. The steel girders are in a ball." One wall of a Chuck E. Cheese restaurant collapsed, windows were blown out, and a piece of the eatery's awning was thrown into a tree alongside an adjacent restaurant. Signs were stripped and cars were damaged in the parking lot. Shawn Tiesman, 33, moved to the apartment complex from Iowa about four months ago and got his first taste of Oklahoma's notorious weather but without the same protection of his former home. "Where I'm from, we've got basements," Tiesman said. "I'm amazed that there's no basements here." Instead, he invited his upstairs neighbors into his apartment and then used his futon mattress to barricade them into a walk-in closet. When he emerged, he couldn't believe the wreckage. Parked cars were shifted by the wind and smashed into each other. A line of fencing and a light pole were knocked to the ground where the twister moved into the backyard of two neighboring homes, leaving tree limbs, children's toys and a smashed air conditioning unit strewn in its path. "I can't believe we didn't hear it. You know how you normally hear it coming," said Traci Keil, 37. Oklahoma Gas and Electric reported about 6,500 customers without power, mostly in southern Oklahoma, ccording to its Web site. Just over 300 Oklahoma City area customers were still in the dark. Eighteen power poles were snapped.